Wearable robotics for the military is the most dynamic subset of the exoskeleton industry. Military exoskeletons are being tested by the U.S., China, Canada, South Korea, Great Britain, Russia and Australia, and these are just the projects that the public is aware of. Many other military exoskeleton projects remain secret. 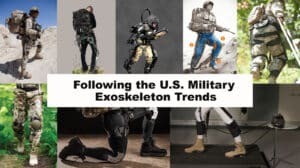 There is still enough information in the public domain to see how much military exoskeletons have changed over the last 10 years and the new direction exo developers have taken. Like the history of war, the history of military exoskeletons is filled with hardship and disappointment. The 1959 book “Starship Troopers” by Robert Heinlein is regarded as the first widely circulated work of fiction to feature military powered armor. While there were some early patents and drawings outlining what a military exoskeleton should look like, researchers in the field realized that the technology is a long way from being put in an active combat zone. The relatively controlled and structured environments of hospitals, rehabilitation centers and factories provided a more fertile ground for wearable robotics implementation. Around 2010, two major exoskeleton projects for the military were brought to the public’s attention: the HULC (Human Universal Load Carrier) by Ekso Bionics and Lockheed Martin and the XOS and XOS2 by Sarcos/Raytheon. Both were full body suits for solider mobility augmentation. Both projects captivated the public’s imagination. But with each article and newscast the capabilities and success of the two exos were becoming more and more exaggerated. So it came with a great shock when the US Military stopped expressing interest in both projects. In just a few months, it seemed that exoskeleton technology had gone from seemingly being months away from full deployment in the military to something useless and not worth pursuing. The downfall of the first military exoskeletons was their size and power consumption. Since both the HULC and the XOS were full body suits, they had large metal frames and multiple actuators. Measuring and characterizing what all of these individual actuators actually did for a soldier was hard enough, but powering them proved impossible. The XOS project emphasized on the development of the motors and control system first, with the idea that battery technology will catch up. The XOS 2 was a tethered exoskeleton that needed to be connected to a power source at all times. When it became clear that no batteries are capable of powering the suit for a long time, the development was cancelled. The HULC project ran into similar power supply issues as the XOS but the Ekso Bionics and Lockheed Martin teams fought very hard to make it work. The HULC was redesigned repeatedly to consume less power. At one point, a small gas powered engine was brought in. But as Boston Dynamics has now found out, the US Military did not appreciate the idea of a loud high pitch engine announcing the position of its troops. Eventually, the HULC was able to move under its own power for several hours and it demonstrated reduced metabolic cost for the soldiers wearing it but the project ran into a new obstacle. The US Military increased the number of hours the HULC should be able to operate without recharging. The project then ran into an infinite loop, to increase the battery life a heavier battery was required, which then required more power to the suit which then required a larger battery and so on. 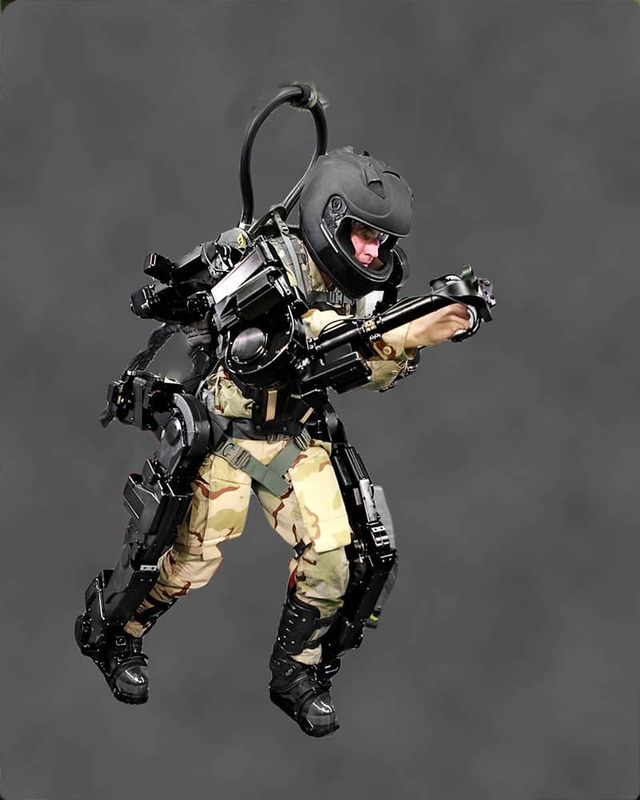 While the HULC was not successful, a stripped down version with no motors and electronics called the iHAS became one of the first passive exoskeletons to show promise for use at work and industry. The iHAS morphed into the Mantis which eventually inspired the Ekso Works and FORTIS passive exoskeletons. Sarcos separated from Raytheon but it is still an active company and is surely working on something interesting. Over the years, military exoskeletons have evolved into smaller, lighter and more specialized devices. For comparison, some of the initial versions of the HULC weighed 53 lb. (24 kg) compared to 11 lb. (5 kg) for many of the new military exos. 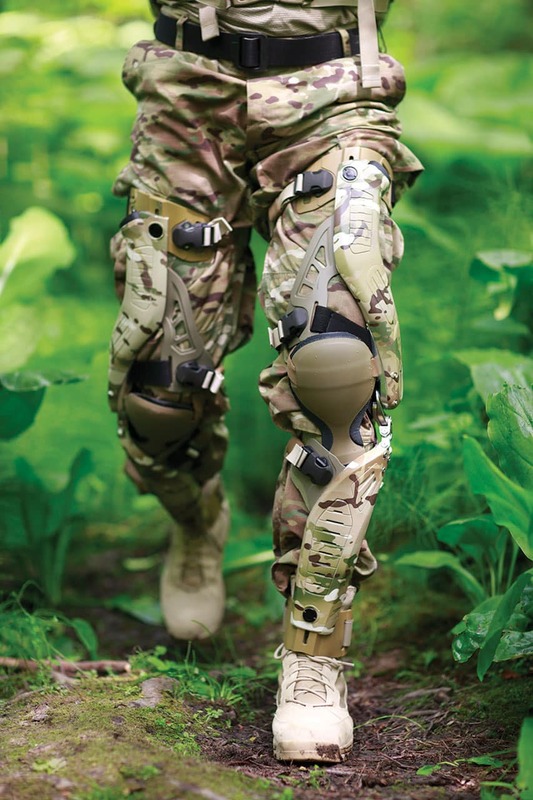 Military exoskeletons face many of the same challenges as their industrial counterparts: being comfortable to wear for many hours and integration with already established equipment and standards. Military exoskeletons have to work with what is already accepted military equipment. For example, if an infantry armored vest interferes with the fit of a military exoskeleton, the exoskeleton has to go. Military exoskeletons have to be universal, yet comfortable and fully integrated with the soldier while not getting in the way of weapons or the ability to take cover. This is why many of the latest military exoskeletons have their motors and actuators at the front or the back of the user. This is in sharp contrast to the vast majority of exoskeletons that have the bulk of the device at the hips or the side of the legs. Furthermore, the exoskeletons have to be reliable and very durable. If a paratrooper needs to jump off a plane, parachute into a lake, crawl through mud and then run for cover to engage the enemy that exoskeleton has to work and not become a liability. There is a real opportunity for the adoption of exoskeletons in the military. As a rule of thumb, the more equipment a soldier has to wear, the less distance they can cover in a day. In terms of safety, the distance a military unit is expected to cover is inversely proportional to how much armor the soldiers can wear. An exoskeleton that can demonstrate a reduction of the metabolic cost of a loaded with equipment infantry can translate to soldiers that can cover more ground, have more supplies, become more independent and have additional armor. All military exoskeletons with the notable exception of the Mojo series by 20KTS+ aim to reduce the metabolic cost of a soldier in one way or another. 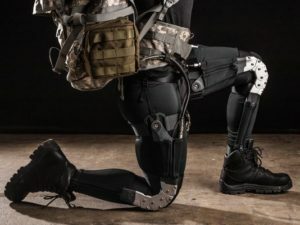 The exoskeleton may apply direct power assistance to the soldier while walking, attempt to transfer some of the equipment weight into the ground or reduce the weight of batteries by recharging smaller ones. The major exception to this rule are the Terra Mojo and Marine Mojo by 20KTS+ which reduce the vibrations on standing soldiers while on small boats or vehicles. Just like the other three exoskeleton subfields (medical, work/industry, consumer/civilian) the military exoskeletons can be divided into categories based on function. These are wearable robots that cover the legs and the arms. Outside of science fiction (movies, books and computer games) there have been few actual prototypes in development. All full body suits share the same weaknesses as the HULC and XOS 2. They are large, have too many actuators and are difficult to power and control. As a result, many later full body projects have been split in half into separate or modular lower body and upper body wearable robots. Lower extremities (or just leg) exoskeletons provide assistance to the legs. If the wearable extends all the way down to the ground, it can also be used to transfer loads. 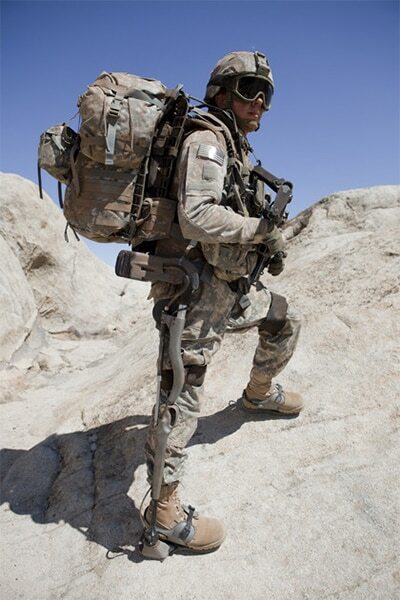 Because a military exoskeleton always has to be flexible and compliant, the amount of load that it can carry while still moving quickly will always be limited. These devices can also be classical with a hard metal frame or be made entirely out of soft materials. This allows for powered leg exoskeletons to be merged into one category based on their main purpose: provide mobility assist and decrease the metabolic cost of movement (a soldier that carriers the weight of their gear and the exoskeleton should expend less energy than carrying just the gear). Passive exoskeletons do not have any actuators, batteries or electronics. Two good examples of what a passive exoskeleton can do for a military are the Marine Mojo and DSTO Operations Exoskeleton. The Marine Mojo by 20KTS+ is designed to absorb shock and vibrations for military personal on small, fast patrol boats. It is a small light dampener system. The Operations Exoskeleton by the Australian Government Department of Defense Science and Technology (DSTO) is a system of Bowden cables designed to transfer a percentage of the weight of a soldier’s heavy backpack directly into the ground. Energy scavenging exoskeletons purposely hinder the soldier in an attempt to collect energy. The collected energy can be turned into electricity to recharge a battery or directly power a device (such as a communication device). Some lower body exoskeletons supposedly can be turned from assistive to energy collective, but that will make them permanently heavier. For an idea of what a rough prototype of an energy collecting knee exoskeleton looks like refer to this article: Exoskeletons Extracting Energy For the User. Usually energy extraction from walking happens at the heel. A compliant element is compressed at heel strike providing a small amount of energy. Historically, energy extraction devices end up producing less energy than the cost of wearing them. The best example of a scavenging military exoskeleton is the PowerWalk by Bionic Power. In May of 2016 the company acquired an additional contract for $1.25 million for initial low volume production of the PowerWalk for the US Army. 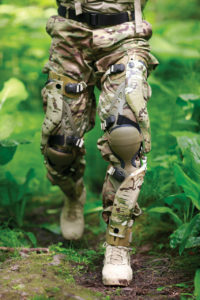 Tandem NSI had a phenomenal article that explains the interest behind energy scavenging military exoskeletons. If we assume that a deployment is 72 hours (3 days), then a soldier needs to have enough electricity to power all of their devices for that entire period. Currently, this comes to 17 pounds of batteries. A device that can carry those 17 pounds (such as a leg exoskeleton) is one way to address the issue. Another method would be to reduce the weight of the batteries by replacing them with a smaller rechargeable that is continuously charged by the exoskeleton during the 72 hour period. If the metabolic cost of the rechargeable device weight and hinderance is smaller than the metabolic cost of carrying non-rechargeable batteries the device will be a success. It might sound counterintuitive why the military would want to have an exoskeleton system that can’t go anywhere, but there really is one under investigation. That is the MAXFAS: A Mobile Arm Exoskeleton For Firearm Aim Stabilization. Based on research on tremor suppression exoskeletons, Dan Baechle wondered if natural hand movements and variations can be further suppressed using the same technology. His initial research is extremely promising and test subjects have been able to improve their aim with a pistol after training on his stationary exoskeleton. Full publication at: udspace.udel.edu. I am functionally disabled (back) is there a exoskeleton in a price range for the injured? Hi Jon, to my knowledge the short answer is No. A personal use exo will cost about $70,000. With some exceptions, the insurance companies are still hesitant to pay for personal use exoskeletons. There are is a growing number of rehabilitation centers that utilize exoskeletons in their programs, but you still have to get into one as normal. Exoskeleton suits, could use body heat and body movement to supply power to a battier. extra strength, would be use full, if a person were to be hurt and have a difficult time moving extra strength could be activated. there is already a watch witch uses body heat. Hi Rolan, thank you for joining the discussion. Unfortunately, current energy harvesting technology still hasn’t been perfected. Turning body heat and body movement into energy are good strategies, but the energy waste and the cost of having to carry the harvesting device still outweighs the benefits in the majority of use cases. In the more distant future, however, I fully expect what you are saying to become a reality. For example, a hiking suit that collects and stores energy for a long distance hiker that can be used to charge electrical equipment (GPS, radio, etc…) and even turn on actuators in case of a leg injury to help get the hiker to safety (but again, this remains a distant future technology). 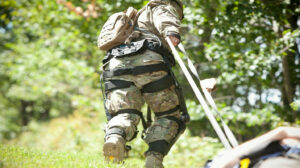 Do you know if exosuits / exoskeletons are being developed for female soldiers? I’m curious as to how you see their impact on women serving in teh military and being able to “keep up” with men. Thank you for any insights you may provide. Hello, Leslie. I do not believe that there are exoskeletons being developed specifically for women at this point. All current exoskeleton projects that I know of are 100% compatible with all genders. I also don’t know if military wearable robots will impact women more. Let’s say an exo can decrease the metabolic cost of carrying a giant backpack by 10% in a male soldier. Will that translate to a greater than 10% reduction on a female soldier? I haven’t seen any data to imply that women respond differently to any exo device than men, but then again, how people interact with wearables is still in the early stages of examination. 1. Military exoskeleton development is moving away from active combat zones. 2. A new rule of thumb (trend) is emerging that powered exoskeletons should never allow the user to lift more than they would naturally be able to. The exoskeleton should enable the user to lift safer, with less fatigue, and with more control but not with more force. Now if this trend persists, then exoskeletons for women will never level the playing field of the physiological differences between the two sexes. 3. This is not to say that military exoskeletons will not have an impact on women. If an exoskeleton allows either gender to perform physical tasks safer, faster, and longer without getting tired then tasks that were deemed not suitable for women might be re-evaluated. 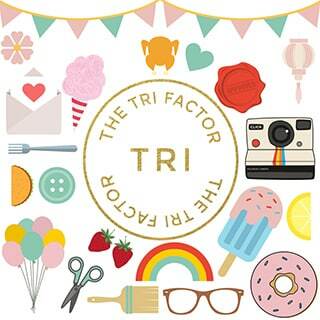 Now let’s combine points 1,2, and three together. The way I imagine one possible future for military exos is a supply depot that lacks full infrastructure and heavy lifting equipment. Women with exoskeletons should be theoretically able to load and unload supplies and equipment, again, safer, faster and with less fatigue. It is important to note, however, that points 1, 2, and 3 are theoretical constraints and observed trends. There are many companies and labs that have not given up on the idea of having combat ready exoskeletons or having wearable robots that can allow the user to lift more than they would normally be able to. What about having to different battery cells capable of holding one positive energy only and the other negative energy only, theoretically it would be like having one giant battery but if you can focus the energy to specific points. Of course the battery shells would have to be made with something that wouldn’t let energy pass through it, however it would also have to be low votile too. Thank you for the thought! It is not intuitive, but I believe a requirement for the batteries is that they are standard military issue. I agree batteries like that wouldn’t be military basic equipment, how the once you figure out the best component or element. That could be used to isolate negative and positive electrons into two different cell shells. Then to take that and apply it to a more accessible material with the same properties. Then you could create it on a mass scale. I got the idea, from the atom bomb(or more commonly known as nuclear bombs) and how it was constructed to hold so much energy, and yet still bigger longer output of energy as well. I think you are on the right track! Ultimately, there has to be an improvement in battery technology for military exoskeletons as engines are too noisy and give away troop location. Hey, great article, how do you think this technology will progress from military use to areas such as wear houses and construction, the impact of this would be huge, making every worker stronger, less prone to accidents and have longer stamina would make every process of construction more efficient. What are your thoughts on this? My question to you is will this be very useful to our United States Military or is this just one of those things the government is trying to get more money out of people to help pay for it? Yes, I think this can be very useful, not just a money sink for our taxpayer’s money. These will not be Iron Man suits that can do everything but instead task-specific devices. For example, a forward operations base has supplies being offloaded from a truck or a helicopter. If the unloading operation can be done safer and faster with an exoskeleton will it be worth the cost? Maybe, maybe not? I think it will take a full market report analyzing current technology, research, potential use cases, and estimated effect to really answer your question. Until then all I can say is that I think there is a real potential for exos to bring a net positive change to the United States Military. Do you think this is telling our military the more we bring technology into something it seems to take over our job for us just like our factory jobs? So could this mean our military will be home more often and have robots fight our wars in the future? No, I have not seen a single exoskeleton device that aims at replacing a person. Quite the opposite, they are meant to enhance the user in one or more ways. I think the military will continue to integrate robotics into warfare, but that trend is likely to continue with or without wearable robotics seeing wider use. Please visit our Exoskeleton Catalog We have include many medical exoskeletons with estimated prices that can give you an idea of the order of magnitude (if they are four figures, five figures, …) of the price of these devices. Dear, Bobby Marinov I’ve been working on my own exosuits for a few year now and i have some questions. Are you ever going to add forms of armor able to stop large armor piercing bullets like 50 cals or higher? Whats the most weight you can move with a full body suit? Are they any plans to increase the speed of a person and how high a they can jump, what about increased swimming ability? I don’t imagine armor plates being strapped directly onto an exoskeleton or exosuit right now unless it is a bomb (ordinance) disposal suit. What I have seen repeatedly though, are prototypes where a ballistic shield is held up using a spring arm. The spring arm then connects exoskeleton which extends to the ground. This way the weight of the shield can go to body mid region and then down. However, there would need to be a counterweight, otherwise, it will just add torque to the lower spine (bad) and the exoskeleton will have to be powerful and quiet. The last part, being quiet is where the problem arises. We have the technology to make an exoskeleton that can permanently hold a ballistic shield, with enough money it can be refined so it doesn’t malfunction and get its user killed, but it is still going to be noisy. I think having a ballistic shield that can swing from an exoskeleton is the way to go for defense for large caliber rounds. Otherwise, a weight distribution system like the Mawashi UPRISE (which transfers part of the weight of the helmet and chest armor to the ground) is the best I have seen. Thanks for you time Bobby. Its a bit sad to hear that the the exo industry is moving away from human augmentation a bit that’s where i’m putting a lot of my force but it still sounds like you have some fuel problems it seems to me and this is just my mediocre opinion that you are using a lot of space for batteries I don’t know how many you use and what quality but I only use one for backup purposes id like to tell you what I use for my primary source but i don’t want to post it online for all to see and someone to take if you want to know though you can email me at jaredcoble25@gmail.com. I know it wont be to impressive but it be nice to hear what you have to say about it, and you might even be able to use it maybe even modify it make it better, also I was wondering and you didn’t say much about this but how much can the strongest exoskeleton you’ve seen lift? A few of mine can lift 2000 pounds to 90 degrees safely and in my strongest suit I can push 1225 lbs above my head I haven’t tried anything heaver as it gets a bit scary at that weigh but i’m only using scrap metals and insufficient motors I would love to get some titanium alloys and some high grade motors but all that costs to much for me right now. I believe the strongest exo I have seen/heard of can handle 200lb. To the best of my understanding, that is not an arbitrary number. Commercial exoskeletons have to fill a need for them to be purchased. So light loads (25lb) can be lifted often, up to 50lb depends on how often the load has to be lifted and if there is any twisting, and after 400lb there are mini forklifts that can help. So the “blind spot” are: repetitive medium loads (15-40lb), larger loads (40-400lb). Everything after 400lb probably deserves a forklift or a lift station. The above is only one part of the equation, the other is guaranteeing the employee’s safety. This comes in two parts: if the exoskeleton malfunctions and it is carrying a heavier load than the user can support, will the user get hurt? The second aspect is if the user has an emergency (heart attack, etc…) and they are holding an immense load, would the exoskeleton be able to support it. I think that combining a need + safety, we will not see exoskeletons that can lift above 250lb enter mass production. I hope you choose to publish your prototype and share your vision for the future. I am sure you have thought of some applications for wearable robots that can lift 1225lb or more.